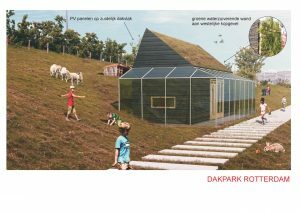 The building on the neighborhood garden will be the meeting place of the Dakpark foundation from which the park volunteers can work and also the many excursions can start. Two Tiny TIMS are linked to create sufficient space for the activities. From the Dakpark it is hardly visible through a green water-purifying wall. On the sloping roof there is a green moss roof on one side and the ‘sheep side’ an energy roof with hybrid pvt solar panels. Solar panels and solar collectors are combined here. In order to make the building fire-resistant, we work with (already) burned wood. The advantage of this is that there is no painting to be done anymore. There are large French doors at the front. Client foundation Dakpark wants to frame the building with a greenhouse. The greenhouse is needed for growing plants for the neighborhood vegetable garden and contributes to a greener appearance. The greenhouse also contributes a lot to the heat management of the building in colder times. Tiny TIM has been thought to be completely independent. Unlike all other Tiny Houses, Tiny TIM is 100% sustainable and autarkic in the field of water and energy. Tiny TIM opts for very sustainable solutions for water purification, drinking water, hot water, toilet flushing, heating and electricity generation.Read> HERE <more. This beautiful roof park is the result of a residents’ initiative about 15 years ago. Together with the city and project developers, the neighborhood has designed the park. This makes this park so special. 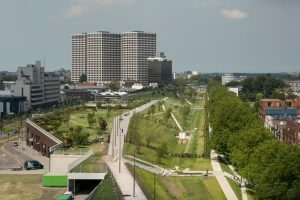 The PARK is also on a ROOF (at 9 meters altitude) and the largest roof park in Europe. The building has to be completed before summer (2018) and is made possible by the Stichting Bevordering Volkskracht, the Oranjefonds, the Job Dura fonds and the VSB fonds. 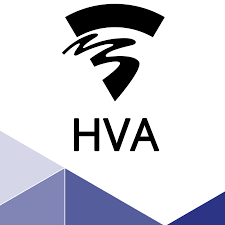 The project is being developed by: Green Art Solutions and architect FARO, commissioned by the Dakpark Rotterdam foundation on the basis of the Tiny TIM concept.